As promised, this post is about a book Dushko Petrovich wrote with Roger White. It's more of a compilation actually. 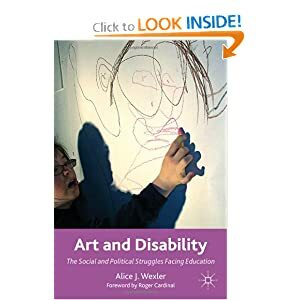 They somehow got a variety of art educators to submit their favorite or least favorite art lesson assignments, and they brought them together in a book. I don't have the book yet, so I can't say much about its actual content, but there's an artforum interview of the team which might be more revealing. Even better, and in true multi-media fashion...there's an WNYC interview of them posted below. From what I can gather, the book is primarily a collection of lesson examples. It's an idea that seems so obvious one might not consider it. This book, however, sounds inventive and full of real world variety. One can perhaps be overwhelmed with such a quantity, but a lack of breath in examples can feel rather suffocating. Anyway, I wish I had found this book sooner! Ok, I still have the blogging bug I guess. So I came across this refreshing piece of writing (I'm still reading Tallis's work too) in the circuitous way only the internet can provide. First, my morning perusing lead me to the delightful work of Ruby Sky Stiller. "philosophy seeks to achieve most directly the state of wonder which art brings us by indirection". At face value I'm not sure I agree with it, but I won't purport to explain it just yet. He's talking more about philosophy either way. I do think the Magritte chosen for the cover (Clear Ideas) works well though. As an aside, something I love about Magritte is that he is usually called a surrealist, yet defies the textbook description of surrealists' motivations. Cross contour line drawings are a mainstay in grade school art classes. They're a pretty straight forward way to teach form and the results can be quite nice if somewhat academic. I don't really plan to create any lessons around them, but I recently found an artist that has done some interesting works that help to revive the idea a bit. This was a video I had seen quite a while ago. It features renowned physicist Richard Feynman. 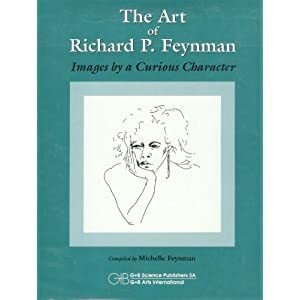 It might be somewhat unusual for an art ed student to be pointing to a scientist for inspiration, but Feynman was an enigmatic character all around. He actually published a book of his sketches. They might not have been the greatest, but it shows he was interested and willing to try (they're actually pretty good too). In the clip he mentions art in retelling an anecdote about an artist friend who (he claims) said that scientists couldn't see beauty in the same way an artist does. Now, this is coming from what might be called a 'different time', and I suspect Feynman might be caricaturizing the artist for the sake of the anecdote. Either way it's always interesting to hear him discuss his ideas. There was recently an article in NY Review of Books about cell phone trucks. In New York City there is a city-wide cell phone ban in public schools. Private companies provide storage trucks (for $1 a day) so students can leave their phones before going to class. I imagine this isn't a problem too many teachers are willing to get fired up about. Maybe. The cost for 'poor' youth is high. And it makes sense their parents want to be able to contact them as they traverse the city streets on their way home. "... the cell phone trucks were, they felt, an outrage. Their phones are not merely a way of getting in touch with friends, but a necessity for their safety". It really seems absurd. One thing the article doesn't mention is the benefit of cell phones IN school. That probably sounds a bit crazy seeing as how most kids can't resist texting in class or otherwise not paying attention. Really though, kids have always found ways to ignore the teacher if they want to. I don't know if cell phones are really the problem there. It strikes me as a missed opportunity. Cell phones can be used in lessons and other beneficial learning activities. They are now a common part of daily life and possibly a necessary one for many people. It is unfortunate to say the least these students have to miss out. I think it's unfortunate as well for the educators. It could be a great way to reach students . Especially for interdisciplinary educational purposes, I would like to explore the affinity between art and science. The first thing to do, I think, is to collect resources. This is a resource I'm 'saving' for the future. "Depicting the hypostasis of light in transparency, glass brings us closer to issues of esoteric metaphysics, that studies, in the deepest antiquity, the supernatural principles of Nature (the ancient Greeks called Nature with the term "physis"). Perpetuating the tradition of ancient thought Avicenna , in X Century A.C., defines Mathematics as an intermediate area between the physical and natural sciences, and metaphysics. Here the "number" and "measure" govern, and between the branches of Mathematics we encounter: Geometry, Arithmetic, Science of Astronomy, Music, Optics, the science (or Art) of “mobile spheres”... and other analogue sciences (Fig. 5). We notice in Avicenna's classification the affinity into Mathematics between Sciences and Arts . In this context glass-art, interceding the optic “avatars of light” and respecting the contemporary scenarios of Science, expresses the fundamental compositional principles and exploits the heritage of human measure's projection in understanding the visual space." Admittedly, I've only given it a cursory reading because I'm researching for a lesson plan, but what first grabbed me is where he mentions 'metaphysics'. He writes, "supernatural principles", but makes a point to state the Greek term for nature, or "physis". So, physics, for the ancient Greeks was the study of nature, and metaphysics was the study of the super-natural; thereby having a somewhat different meaning than we take 'supernatural' to mean today (or so I'm thinking from this quick read). I think he's trying to use supernatural without implying 'mystical' to describe metaphysics. Anyway, there's a wealth of intriguing work on his site (linked above) to explore. 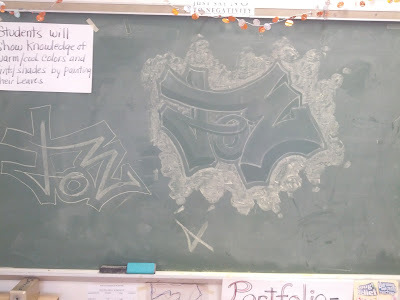 This was an example I did on the board during a lesson I gave to 4 classes of 8th graders. It was basically a very straightforward beginner's lesson on how to draw a graffiti tag. (A 'tag' for the uninitiated is just your general graffiti subject. It's just your name, or nickname, or whatever people call you or whatever you want to be called. There are few rules with it). In my last post I talked about complexity specifically in the work of Oliver Vernon . His work is merely one example, and lest I appear like a detail junky or something, I should say that the work does come off as a bit epistemically barren. I wouldn't say it's only formalist in its concerns though. Maximalism is interesting in itself as a concept. ... and that would be interesting. But for something different I thought I'd mention a piece we discussed in Modern Chinese Art History class the other day. 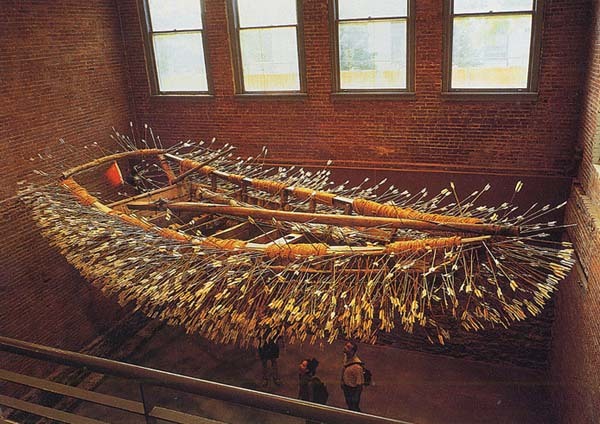 The work of Cai Guo-Qiang's work is fascinating. This piece in particular is based on an ancient Chinese fable about two armies. During a great battle in the 3rd century (I think) one army ran out of arrows. So they devised a clever trick to send over an empty boat in the dead of a foggy night. When the boat reached the other army they reacted and shot innumerable arrows at it. Somehow the first army got it back and retrieved the arrows to use in the next battle. Lesson planning is the bread and butter of grade school teaching. Most everything a teacher does revolves around the lessons, of course, and the material form of those lessons should include a fair degree of detail. Art educators' lesson plans are somewhat different than other subjects plans (usually more colorful). For one thing, we have to create a, "teacher's sample". Or, we have to actually execute the lesson ourselves before we expect the students to do so. This is the fun part though. We are encouraged to use our own styles (which I actually find it difficult to do because of the technical complexity of my personal work). But in this case, we can approach a lesson plan as we might approach our own artwork. Artists don't only do art, they enjoy the work of other artists. So finding inspiration for a lesson plan can often be found in the work of an artist or artists just as we might for our own work. A painter I recently discovered who I might find some commonality in is Oliver Vernon . I just wanted to make a point to mention Tim Rollins and K.O.S.. I see it as a modest ideal to aspire to (and possibly beyond) in art teaching. It more or less sums up some of the most pertinent aspects of teaching art. Not so much the, 'community' aspect (however important), but just taking students with the interest and doing something with it. For teachers it should make things somewhat easier. I'm sure the term will still be used for the sake of clarity. The term Austism is so broad, but at the same time, even Asperger's did very little to narrow that down. Either way, a nominal change such as this won't change how valuable the arts are to these children's development. This is just a quick post about a neat art project. A college student basically just took a pinball machine and created blank posters to cover over the board. The flippers are still shown and somehow ink is injected (he doesn't make that clear exactly).